OverviewA vertical scrolling arcade shooter released by Capcom. It was re-released for platform play on Capcom Classics Collection. 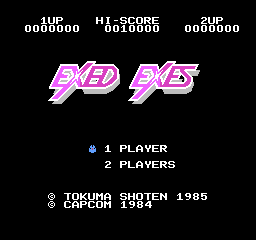 Exed Exes is a relatively straightforward top-scrolling shooter. The main way it stands out is in the odd mix of elements: enemies are skulls and insects, but bonuses are cute little fruits? The variety of weapons is less than in other similar games. This is one of the easiest games of its type, and will serve well as a set of training wheels before tackling more difficult shooters. 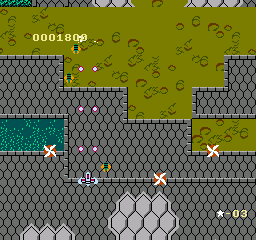 The standard weapon is a forward shooter, but with limited range (about half the screen). The sound and music are primitive, but usually not annoying. This game does not exactly compare favorably against games like Zanac or even Xevious, but it will probably find some fans because of its relaxed pace. Now you can add videos, screenshots, or other images (cover scans, disc scans, etc.) for Exed Exes (Japan) to Emuparadise. Do it now! If you haven't noticed yet, we have a retro game of the day feature (top-right of the screen) wherein we feature a new retro title every single day! Now, you can vote for your favorite games and allow them to have their moment of glory. 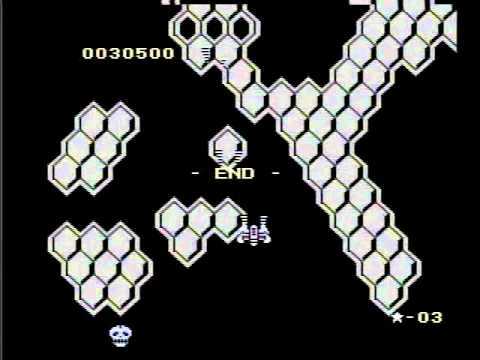 Click on the button below to nominate Exed Exes (Japan) for Retro Game of the Day.